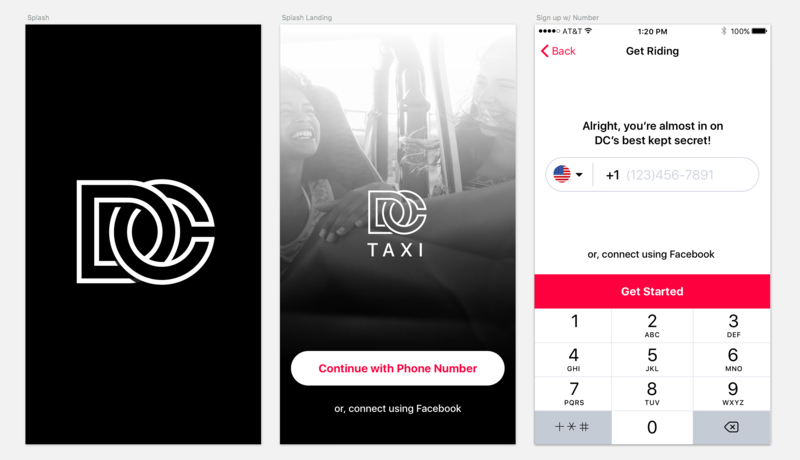 DC Taxi is a rideshare app that operates in the city of Washington, DC. 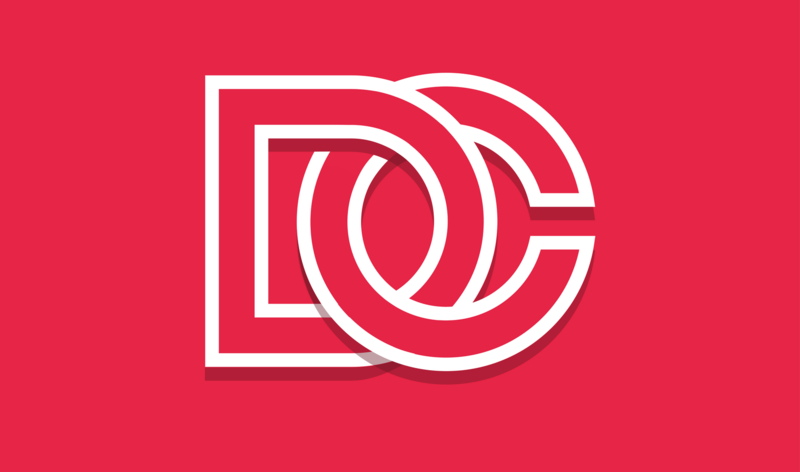 The design is an MVP and is currently being tested by DC.gov. The Department of For-Hire Vehicles (DFHV) in partnership with the Department of Public Works (DPW) launched the Vehicles on Demand (VOD) pilot program. 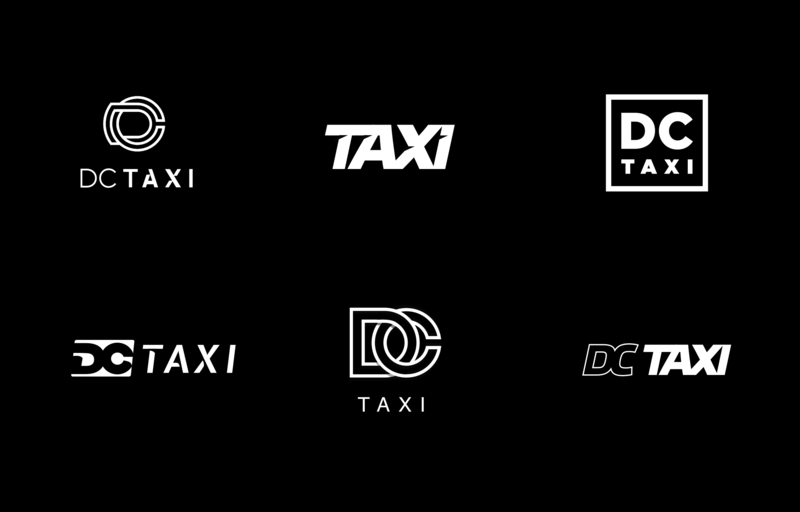 A specified number of District Government employees will be able to use DC taxicabs to travel in the city for official business. 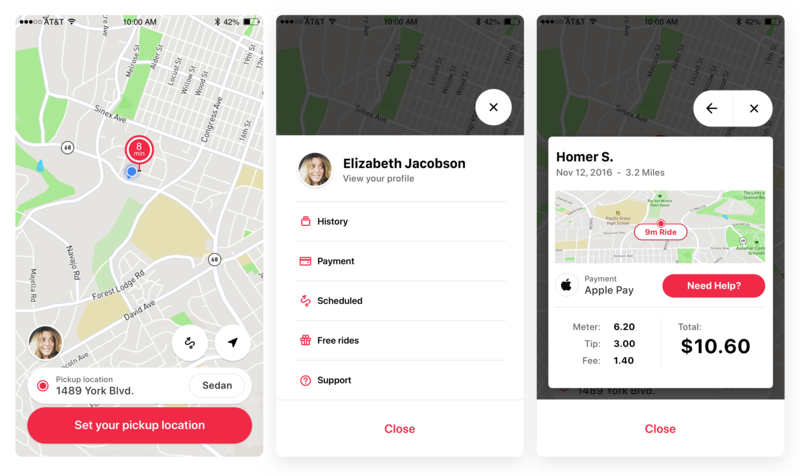 The pilot will provide employees with an additional transportation option, while increasing the availability of existing fleet share vehicles, allowing agencies to right-size their fleets and ultimately realize cost savings in vehicle purchases, fuel, and maintenance. As part of my design process, I prototype and test with people. I also do it to communicate animations and gauge feasibility with engineering. But for this quick prototype, I did some guerilla research with 5 participants to validate that the patterns being used were consise and made sense to the users. As I'm sure you would guess, all of them compared the application to Lyft and Uber. There is a strong mental model established when it comes to ridesharing and booking transit. It was clear that I shouldn't deviate too far off the beaten path. It was important to communicate all states of the hailing process. 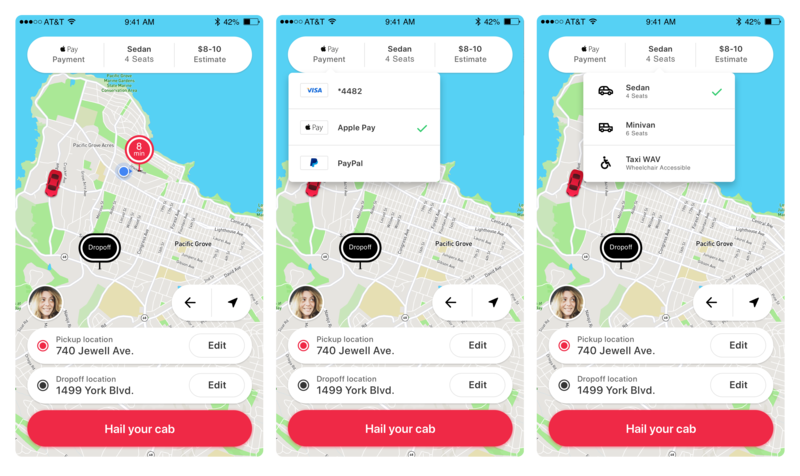 Users wanted to know when they pressed, 'Hail your Cab' that the application was doing something. It was necessary to denote the states between searching, confirmed, and arrived. Also, it was important to clearly communicate time estimates. Once the ride was confirmed and the driver arrived, the application perspective animates to position the rider's location in the forefront. 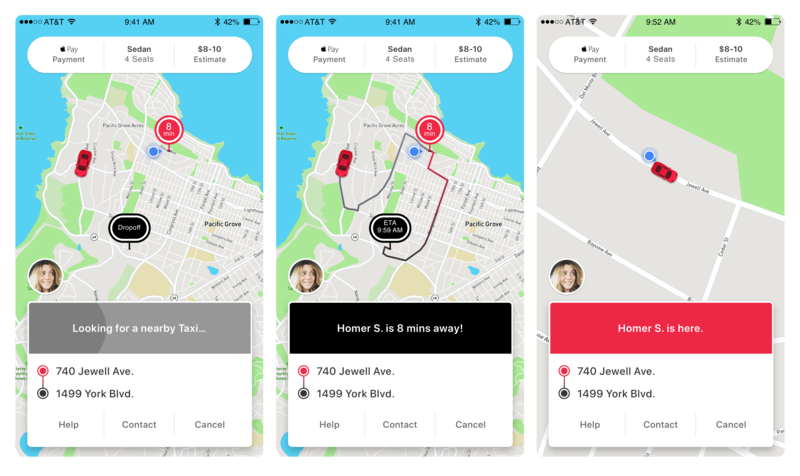 This would allow them to view their whereabouts similarly to how they would see driving direction on Google or Apple maps, another familiar pattern that is established. The navigation for this application was designed to optimize the map view. To access the navigation, a user must press their profile avatar. I was concerned that this wasn't enough affordance for the navigation and that users would be confused as to how to locate the navigation. It turns out that it was pretty easy for them to find it by clicking on their avatar. 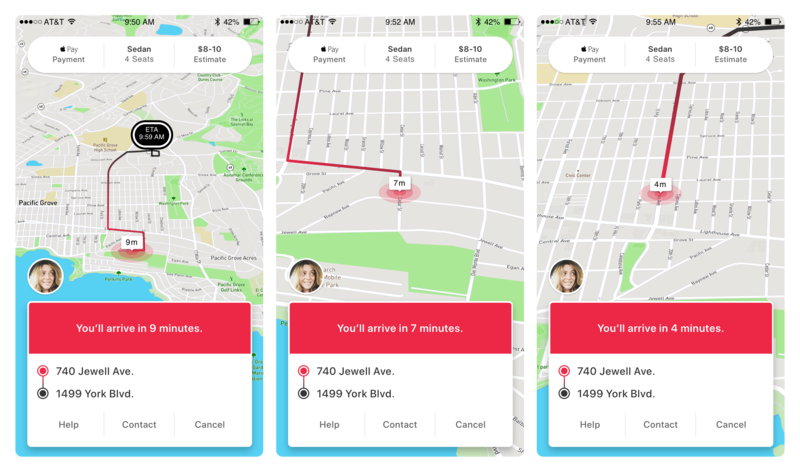 They'd mentioned it was similar to how Lyft and Uber navigation worked. Every user account was required to have a phone number associated with it. In this case, mostly government employees would be using the application and this was how they were differentiating between government and non-goverment employees for the pilot.